Who doesn’t like a chuck wagon with a bunch of wooden soda kegs on it? It seems that the people at Chuck Wagon Old Fashioned Sodas decided to capitalize on that sentiment and thus they own and sell these wagons to people to set up stands at various county fairs and festivals. It is a pretty cool concept when you think about it and is doing it’s part in the Root Beer Revival. Though I’m curious, other than the cool old-fashioned wagon, what makes this an “OLD-FASHIONED SODA?” I’ve been wondering because there are so many root beers out there that claim old-fashioned, yet their flavors and ingredients vary widely. Unless, of course, root beer itself is an old-fashioned flavor which would mean all root beers would be old-fashioned. Hmm. This sounds like a great topic for the next IAGRB Standards Committee Meeting. Anyways, they also bottle their sodas as evidenced by the fact that I was able to procure two bottles to review, which makes them extra cool in my book. This has a sweet medium Body with a pronounced caramel flavor that is nice and creamy. It has a nice mouth feel to it as well. I really love that flavor. There isn’t much Bite; it is nice and smooth with some subtle spice accents and fizz. The Head is medium height and froth, adequate. The Aftertaste is caramel with slight vanilla hints coming through. Delicious! Wow! I love the taste of this brew. The creamy mouth feel is an added bonus as well. Good job! There’s nothing wrong with this root beer at all. There could be more right, like an even better Head and more spices for additional complexity, but they’ve essentially captured the proper root beer drinking experience and emphasized that amazing flavor. It is as the say, “SODA-LECIOUS”. 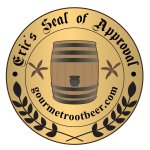 I’m proud to give them my Seal of Approval, and look forward to drinking more of it in the future. See how it rates against other root beers. Since this root beer is sold primarily at outdoor events, the head is minimal so that the vended product can be served quickly. With a small head there isn’t much waste and results in a full mug of beverage instead of being so much foam. There is no compromise however in the flavor profile… it is excellent! It is an excellent brew.